Updated in April 2019 with new buying guide and 3 new trikes joing our ‘best toddler tricycle’ picks. Enjoy! Sorry for the sentimentality but I’m going to get nostalgic here for a second. 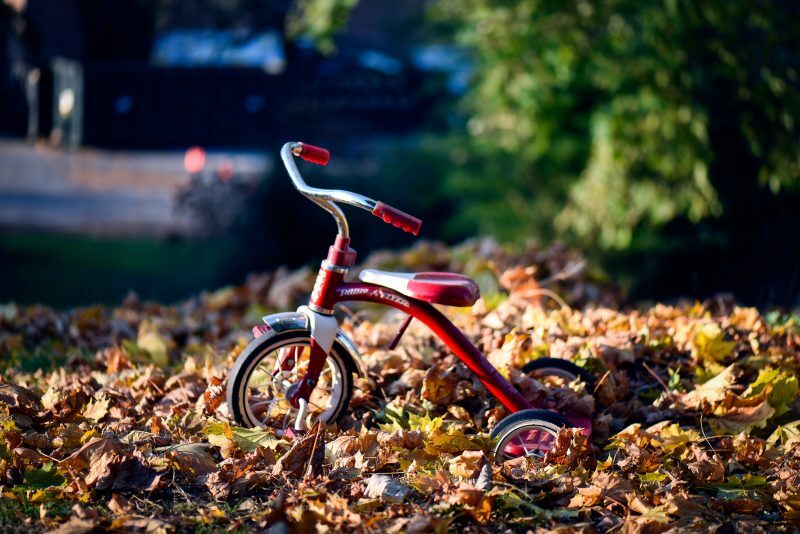 My red-framed, black-and-white-wheeled tricycle was the toy of my childhood. I rode it every day for a month – no joke – pretending to be a salesman, peddling imaginary wares to my aunts, uncles, mom, dad, grandma, grandpa, whoever was around. My best toddler tricycle gave me confidence, taught me responsibility and it was fun as heck to drive. .Fast forward nearly thirty years down the road and, thanks to the efforts and ingenuity of companies like Fisher-Price, Radio Flyer and Fly Bike, the best toddler trikes available today make mine as outdated and prehistoric – and ultimately as uncool – as an Atari next to a PS4. Canopies. Lights. Large wheels. Racing flags. Post-modern designs. The accessories and add-ons are aplenty, and each is designed with enough up-to-date safety specifications that nervous mothers and fretful fathers need not feel anything except A-Okay about letting their little ones ride around in one – under a watchful eye of course. And, not only are they fun, but they’re pretty darn practical as well. As crawling is to walking, trikes are to riding bikes. 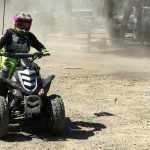 They’re a rite of passage, a must-have for anyone, 2 to 10 years old, as they provide the foundation for life on the move – from three wheels to two, and then back up to four. Don’t believe us? Just check out some of our reviews for the best tricycle for 2 year old and 3 year old. You might know Radio Flyer from their high-quality, retro-style wagons (see our wagon review). But, believe it or not, they appear to put forth just as much time and effort into their trike construction as well. Just take a look at the super versatile Radio Flyer 4-in-1 Trike – the best toddler tricycle in our opinion. Its ability to transform into four different vehicles, an infant trike, a steering trike, a learn-to-ride trike and the ever-necessary “classic” trike, means that the Radio Flyer 4-in-1 covers all the bases in the world of trike training. And, not only that, but it grows with your little one, from 9 months to 5 years. Safety features include a wrap tray that doubles as a drink and snack holder, Adult Steer & Stroll, for when they’re not quite ready to ride on their own, a grow-with-me style adjustable seat, a canopy for UV protection, a comfortable headrest and, of course, a 3-point harness for the bumpier rides. It also comes equipped with a covered bin for extra storage – either for you or your little one – and a solid steel frame for advanced durability. Weight capacity is 49 pounds. Some assembly is required. We recommend checking latest price and free shipping deals on Amazon – here’s the handy, direct link to the Radio Flyer’s product page. Versatility is obviously the name of the game when it comes to trike construction because, as with the Radio Flyer 4-in-1, the Fisher-Price Rock, Roll n’ Ride offers an exciting experience for all stages of toddler-dom – and beyond. Is this the best toddler tricycle? We pretty much think so. Its extras are rather lacking, especially when compared to some of the other trikes on this list, relegated to a footrest for the rockers and the riders, but, with such bang-for-the buck, grow-with-me value, it’s hard to argue with. 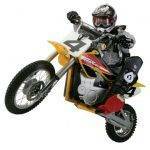 For kids aged 1½ to 5 years old. Weight capacity is 50 pounds. Some assembly is required. Check out the Amazon for the best price and first-hand customer reviews. Caution: Cool kids need only apply. The Fisher-Price Thomas the Tank Engine Trike is ultimately the most tricked out tricycle of the five in this review. What it lacks in overall adaptability – it doesn’t covert to different forms like the first two on this list – it more than makes up for in cool kid gadgetry. 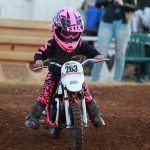 First of all, its wide, stable wheelbase and large front tire offer faster pedaling for all the little wannabe speed demons out there. Its sturdy frame and easy-to-hold handlebars make for fun and friendly twists and turns. And, last but not least, it comes with an array of Thomas & Friends-themed lights, sounds, music, stickers and “walkie-talkie” phrases from the show. That alone makes it one of the best tricycle for 2 year old or 3 year old (although kids up to 6 years old can enjoy it). Its seat is three-point adjustable so it grows as they go. Its pedals are slip resistant. And it even comes with an extra storage compartment for all your little one’s extra odds and ends – like a pair of sunglasses, or maybe even some sunscreen for the super-responsible. For kids aged 2 to 6 years old. Weight capacity is 60 pounds. As we write these words, Amazon seem to have the best price – direct link. Sometimes, when your kids reach a certain age, they just want to ride. They don’t want to press a bunch of buttons and have the whole thing sing a song. They don’t want to be pushed around. And they definitely don’t want it covered in a bunch of silly stickers. They just want to be able to hop on and have some fun. Enter the Radio Flyer Big Flyer Trike, in our opinion the best toddler tricycle for 3 year old. With real chrome handlebars, molded handgrips, a racing pennant and realistically-styled gauges, your little one will feel as important as you do when you hop in your car for a drive around town. Its big front wheel, complete with a performance grip tread that hugs the road like an overprotective parent, means it’s a safe yet speedy ride. Speaking of safe, much of its aforementioned awesomeness – racing pennant, molded handgrips, etc. – double as safety features for easier handling and enhanced visibility. (Which will make “letting them go” that much easier to do). For kids aged 3 to 7 years old – thanks to a seat that can adjust to up to three different heights. Weight capacity is 65 pounds. Some assembly is required. If you’re interested, you may want to consider buying on Amazon (direct link) due to free shipping and the best price – we checked. No we come to the oddest trike on the list: The Anti-Trike. Everything that the other trikes offer, this one does not. It’s void of accessories. It doesn’t transform. The Fly Bike Foldable Toddlers Glide Tricycle doesn’t even have pedals. No pedals? That’s right. No pedals. It’s a glide tricycle, which means your kids kick off with their own power to get things going – a design that helps foster and develop proper balance and refined steering. It’s a no-frills, minimalistic style tricycle that folds like a card table in a matter of seconds thanks to its 3-step folding system – which means you and yours can take it pretty much anywhere you want to. 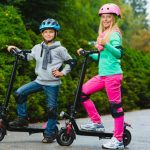 Not only that but the trike’s lightweight, compact design, paired with its rollerblade-like wheels, makes for a speedy spin – inside and outside the house – feels almost like a crazy cart! For mobile kids under 40 pounds. No assembly is required. Comes ready, right out of the box. 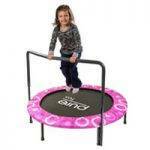 Learn more and get latest price here on the Amazon Product Page. UPDATED: We decided to add 3 more toddler trikes to our list, as we think they’re absolutely worth checking as well. Coincidentally, these are the models that visitors of our website were searching most over the past year. We checked those trikes and found out that they’ve been recently gaining popularity on Amazon. Therefore, we couldn’t resist taking a closer look at all three trikes. Here we go. The Schwinn Roadster Trike is the Harley of tricycles. Featuring a crisp, daring red frame accented with chrome and black accessories will have your child’s trike be the envy of preschoolers everywhere. This tricycle features a low center of gravity making it a perfect first bike for your little one. The sculpted black seat has five positions to set as your child grows or even to share among different sized family members. The heavy-duty steel, fenders, etched in logos, tassels, and bell make this trike a solid piece of art that will be around to admire for years. >> Checkout Schwinn Roadster Trike on Amazon. The Radio Flyer Red Rider Trike perfectly incorporates the beauty and strength of classic Radio Flyers with the features we look for in our new age world. It’s simple yet elegant design features an adjustable seat to grow with your child, sturdy steel construction with quiet ride wheels, and comfort grip handlebars. This trike is perfect for any level of trike rider from beginner to advanced. With a built-in storage bin to carry your child’s precious treasures and an easy carry handle for convenient adult transportation, you cannot go wrong with the Radio Flyer Red Rider Trike. 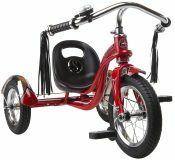 >> Checkout Radio Flyer Red Rider Trike on Amazon. The B. Duck brand is not as widely recognized as Schwinn or Radio Flyer, but this trike easily rises to the level of these brands. The B. Duck Trike is recommended for ages 10-24 months. It features an easy to assemble design; no tools necessary, simply snap in the handlebars and you’re ready to ride. A carbon steel frame makes this trike both sturdy and light enough for your little one to handle. The durable widen silent wheels, that are enclosed to protect little feet, allow for easy riding both indoors and out. The no pedals design of this trike allow your child to master balance, stability, coordination, and steering raising children’s confidence. With five different colors to chose from this trike begs to be your child’s next favorite toy. 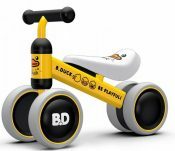 >> Checkout B.Duck Toddler Trike on Amazon. 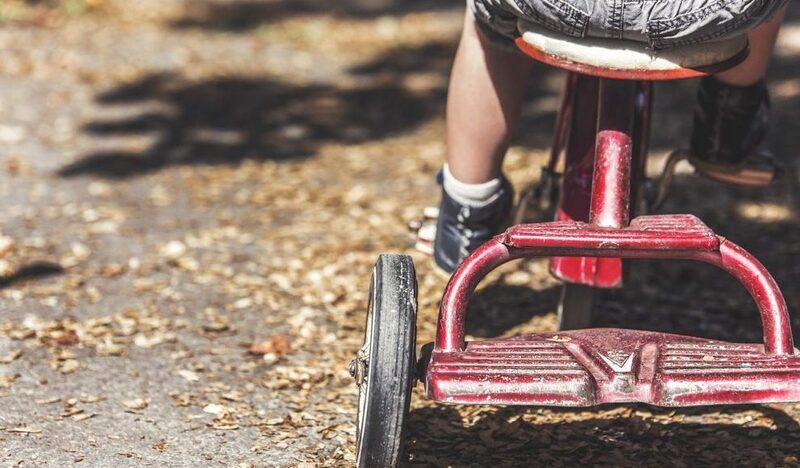 Purchasing your child a tricycle is much more than simply another toy to clutter the driveway. A toddler’s tricycle is a step towards their independence. Their glimpse of freedom. Their tool for exploring the world around them. Just like when they turn 16 and you hand them the keys to their first car, when your child steps on the pedals of their first tricycle you want to know that you did your part in keeping them safe. 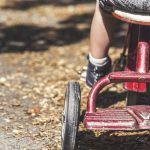 While we can’t give you advice on how to survive drivers training, we can give you the best tips when buying your child a new trike. Here are the top features you should look for in a tricycle before hitting that check out counter. Choose the right fit for your child. Parents often make the mistake of buying a bike a little bit larger than their child can easily use. Children grow so fast and it’s easy to fall into the trap of buying two sizes too big so that they can grow into it. This common mistake leads to many troubles. Your child will quickly grow discouraged with pedals that are too far away to touch and handlebars that are too big to grasp. By the time your child grows into the tricycle of their dreams it will have been lost in the back of garages and sheds, long ago forgotten about. That’s not to mention the many potential dangers of a too big for your tot to handle trike. For the sake of safety and comfort choose a tricycle that fits your child now. When he or she is seated their feet should rest flatly on the pedals. There should also be enough room between their knees and handlebars to comfortably pedal and turn. To properly navigate their newfound freedom, ensure your child can properly control their ride. Another feature to investigate before you spend your precious dollars is the durability of the tricycle. Check the metal type and welding areas to ensure the trike is of strong, secure quality. Many tricycles also have recommended weight and height guidelines that are important to take into consideration. How the tricycle is designed for use is also something you will want to keep in mind when searching for the perfect tricycle for your child. Some trikes feature a handle for adults to push the child along. While this is wonderful for a stroll down the block, it may prove to be much more taxing three hours later when you’re breathlessly panting behind your child. If an adult handle is a feature you prefer, look to see how easily the handle is removed and re-assembled when desired as well as if the child has independent pedaling abilities. Always remember, properly fitting helmets, elbow and knee pads should accompany each purchase. With each step of independence, your child makes comes a feeling of pride knowing you have given them all the tools they need to be safe, to be fearless, and to pedal their little hearts out on their brand new tricycle! Pls I need one. How do I get it? Check out Amazon or any other retailer. Our post includes links to all those products on Amazon.